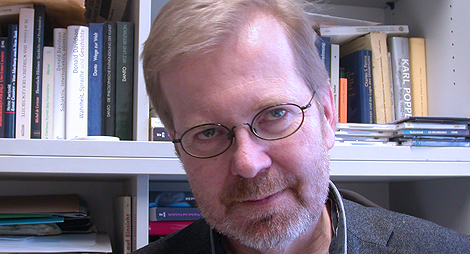 Albert Müller, born 1959, studied history and German literature and received his PhD from the University of Graz. After 14 years at a social science history research institute he joined the Department of Contemporary History of the University of Vienna in 1998. There he became responsible for the Heinz von Foerster and the Gordon Pask archives and for supporting international research activities. During the last 15 years cybernetics more and more became a focus of his work. He is a co-editor of the book “An unfinished Revolution: Heinz von Foerster and the Biological Computer Laboratory”. In 2009 he was elected a trustee of the American Society of Cybernetics. As a general secretary of the Heinz von Foerster Society he acts as a co-organiser of the biennial Heinz von Foerster Congresses since 2003. He is among the editors of the Austrian Journal of Historical Sciences (Österreichische Zeitschrift für Geschichtswissenschaften) which regularly is devoted to themes like constructivism, cybernetics, system theory etc. It is with great sorrow that we have to report to members the death of Ernst von Glasersfeld. Ernst died 12 November 2010, at 7am US east coast time. Here is an obituary on the Constructivist Psychology Network. Another obituary by AP in the Washington Post. A recent Special Issue of Constructivist foundations dedicated to the work and memory of Ernst von Glasersfeld. The website of the Cybernetics of Cybernetics Competition is now on-line. C:ADM2010 participants can continue to work their paper proposals and discuss each others' paper proposals via the profile page. To give some background on the format of C:ADM2010, we have posted a short text by Nagib Callaos on conversational conferences here. The C:ADM2010 blog is now open. Please feel free to use it to suggest and discuss how the conference conference shall unfold. Ernst von Glasersfeld delivered a talk after the C:ADM2010 conference dinner. Listen to it here. UPDATE: Manuscript added. John Sims, member of the C:ADM2010 International Advisory Board recently gave this interview to Nature magazine. Please help spreading the word about the C:ADM2010 conference by using our poster fliers. You can download them here in PDF format for printing and in JPG format for emailing and viewing on screen. Copyright © 2010 American Society for Cybernetics, All rights reserved.